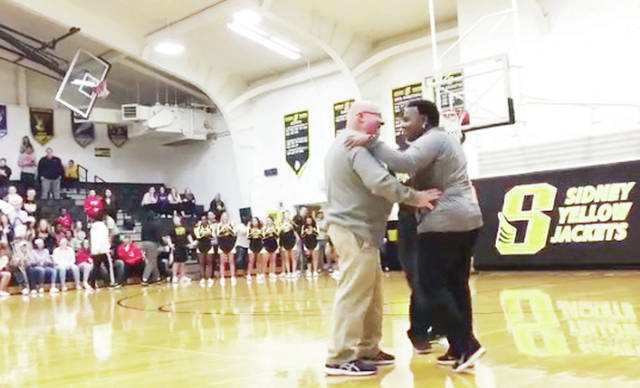 Lehman Baseball Coach Dave King, left, is congratulated by Sidney High School Assistant Athletic Director Maggi Williams after King made 3 baskets to earn a donation of $30,000 from the Tim and Amy Gleason family and the Realty 2000 Group for a new indoor complex at Sidney High School. King made the shots during the Sidney vs Lehman Catholic boys basketball game Monday, Feb. 4.
https://www.sidneydailynews.com/wp-content/uploads/sites/47/2019/02/web1_SDN020819Donor-1.jpgLehman Baseball Coach Dave King, left, is congratulated by Sidney High School Assistant Athletic Director Maggi Williams after King made 3 baskets to earn a donation of $30,000 from the Tim and Amy Gleason family and the Realty 2000 Group for a new indoor complex at Sidney High School. King made the shots during the Sidney vs Lehman Catholic boys basketball game Monday, Feb. 4.